Read a brief summary of the ACDA in 2018. Rare Disease Day is an international advocacy day to bring widespread recognition of rare diseases. 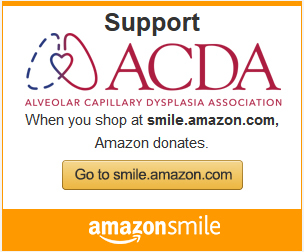 Click here for a list of ways to give this holiday season while raising money for ACDMPV research. Families affected by ACDMPV have shared their stories and raised awareness through various news outlets. Read the articles here. In October 2018, the ACDA organized a photo project of bereaved parents. Click to view. October is National Pregnancy and Infant Loss Awareness Month. Click to participate in the International Wave of Light.